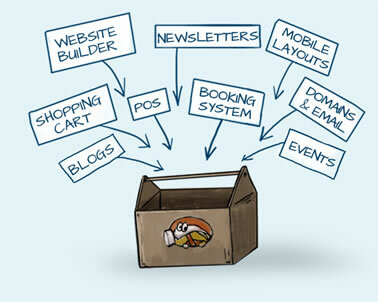 content management and e-commerce system. Build your customer base with blogs , news and forum pages. Post upcoming events , and stay in touch via newsletters and subscriptions . Don't pay extra for add-ons and plugins. Everything is included at website.world. "I'd like to do it myself"
when you're ready to go live. "Can you build it for me?" We have a list of talented web designers and resellers who can assist with the design and build of your website. "Can you copy my existing website?" Yes we can copy your existing website and maintain your existing content and design as a starting point. "I need a web address"
Start by reserving your desired website address. You can then add email accounts and a placeholder web page. Start building a website, or setup a WordPress account.